Vale Chapter No. 5256 meets in differing locations in the West Lancashire Province, sometimes in Carnforth, sometimes in Barrow-in-Furness, and I was honoured to have given a talk on their May meeting in Carnforth on the York Grand Lodge. Carnforth is a beautiful historic town tucked away in the far north-west corner of Lancashire, not far from the border with the Lake District, the old county of Westmorland. After the talk, we had a great meal which consisted of local cuisine and local ales. The talk went down well and I was invited back next year when the Chapter meets in Barrow-in-Furness. The topic next time will be the Wigan Grand Lodge. The Masonic Hall in Carnforth. Location of my talk to the Vale Chapter. The Shovel Inn. Some nice real ales on tap. 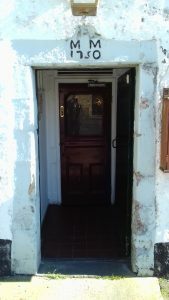 The doorway to one of the oldest pubs in Carnforth; the Shovel Inn, situated near to the Masonic Hall. The date above the doorway is 1750.